Where friends send friends for Long-Term Care Insurance. 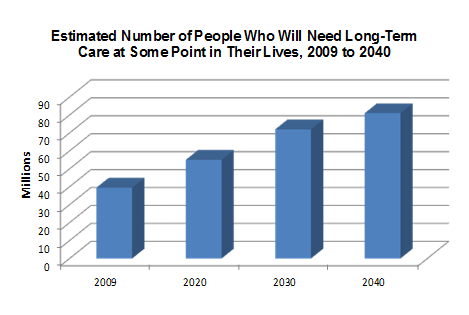 Growing needs and rising costs mean that paying for long-term care is becoming a greater concern for more people. Long-term care funding options have evolved to keep pace not only with the expanded definition of long-term care but also with the need to cover greater numbers of people more cost effectively. Make it an Asset, Not an Expense! There may be no greater threat to your retirement than the expenses associated with long-term care, as 70% of Americans over 65 will need some form of care. ​Long-term care or LTC is a wide range of ongoing services and support systems designed to help individuals perform daily activities when they are unable to do so themselves. Cost Certainty: Asset-Based solutions allow a plan to be funded in a variety of ways, from a single deposit all the way to a monthly payment, with the key point being that clients will be completely shielded from ANY future increases to the cost of their plan. Long-term care insurance is not for everyone, nor will the same type of coverage meet the needs of every person. 2 U.S. Department of Health and Human Services, Administration on Aging, based on data released in August, 2008.